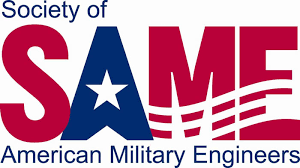 Childs has been active at the local posts of the Society of American Military Engineers (SAME) this February. Our staff exhibited at the Boston Posts Small Business Conference where it was a great chance to meet up with some familiar faces and to make some new contacts while learning about what the local branches of the military are up to. Later in the month Charlie M. Roberts, PE, D.PE co-presented a presentation of the ASCE MOP 130 – Waterfront Facilities Inspection and Assessment manual to the Narraganset Bay post.